Bizarre bright spots on Ceres—one of the largest celestial bodies in the solar system that is not a planet —caught NASA scientists by surprise when they were first spotted earlier this year. New data confirms that the “alien lights” don’t belong to aliens after all. Nothing like this has been seen in the solar system before, and at the latest count there are some 130 bright areas on Ceres. 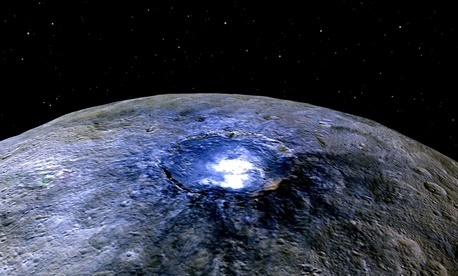 Closer images and data from scientific instruments onboard the Dawn spacecraft, which is currently in orbit around Ceres, have allowed scientists to carefully study these areas. They have now published their findings in a study in Nature . Researchers from the Max Planck Institute for Solar System Research believe that the bright material probably belongs a type of magnesium sulfate called hexahydrite, with probably some briny ice-water underneath it. It is likely that asteroid impacts dug up the salts. The mineral doesn’t generate its own light, but reflects as much as 50% of sunlight falling on it. The Occator crater, which is about 90 kilometers (56 miles) wide, houses the brightest spots on Ceres. Close-up images show a haze near the surface, which may be water vapor. More details about these eerie lights will need to be confirmed with better data, which Dawn will keep beaming back to Earth for at least a few more months.